« A good picture is worth a thousand pounds . . . When you set up a new advert with Direct Villas Florida, the enquiries you receive by default will be one of two types. 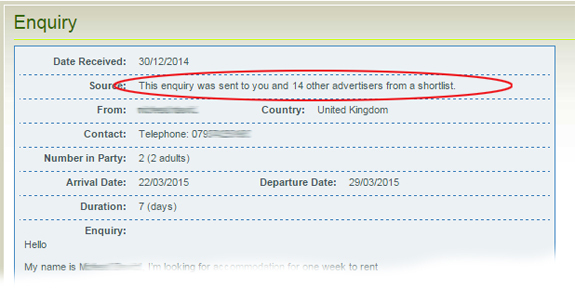 These enquires are your hot leads generated directly from you own listing page! The holiday maker has spent some time browsing the site and refining their search, until they’ve narrowed down their options to just one Florida vacation rental that provides the best match to their wish list. Direct enquiries are likely to be the easiest to convert to bookings and should be followed up as quickly as possible. If you are not able to answer immediately, set up an automated reply confirming you’ve received the request and will be in touch at the earliest opportunity. Aim to reply within 24 hours. Don’t leave your potential guest waiting so long that they start their search again looking for alternatives! In some cases, holidaymakers may be a little more flexible in their requirements for their holiday home accommodation in Florida. As they are browsing the options, they can add the properties that they are interested in to their shortlist. The shortlist gives them the option to compare different features – perhaps narrowing down their choices at this point – before completing one quote request that is sent to all the rentals on their final list. Shortlists may contain homes at different locations, of differing sizes and offer a variety of features. As an owner, you will know just how many properties are in the shortlist but you may need to do a little more questioning, to help you find the best way to win the booking. You know you have some competition – but at the same time, you know your home has something that got it included in the shortlist. As with the Direct, you can be confident that they have seen your property details and again a prompt response could give you the advantage needed to secure the booking. Direct and shortlist enquiries are both good quality leads and may well provide all the business you require for your Florida rental property. Those owners that wish to continue to work only with direct and shortlist need do nothing more. We’ll continue to work hard to keep Direct Villas Florida viewing high on the search engines and promote the site on our own social media platforms, helping to drive traffic to view your holiday rentals. And by working with these targeted enquiries and your feedback, we’re able to develop more additional features to help you increase your business. But what if you have the time and energy to deal with even more enquiries? We can help there too! These enquiries are generated from redirected traffic if the initial enquiry has not resulted in a booking. They are generated at the request of a holidaymaker, forwarding their original enquiry details to a shortlist of homes that match their criteria. These ‘forwarded’ leads will only be shared following a 24 hours delay, in order to give the original recipient every opportunity to respond to the original direct enquiry. ADDITIONAL enquiries will be sent to a maximum of 25 owners who have opted to receive them. If more than 25 homes match the criteria, the ‘shortlist’ will be selected at random. Additional enquiries help encourage visitors to look at alternatives within our own portfolio of homes where their first choice has not been secured, rather than leaving the site to shop elsewhere. They are sent ONLY at the request of a holiday maker and ONLY to those owners who wish to receive them. Please reply to all. To keep the system working efficiently, we do request that you respond to every ADDITIONAL enquiry – even if it’s just to let the holidaymaker know that you no longer have the dates available. How are they generated? 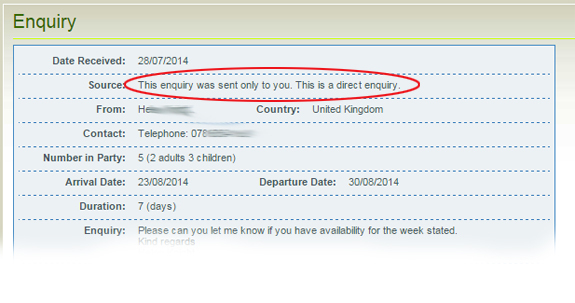 Where a holiday maker has requested a quote from a single property, they will then be taken to the following screen. Here they can choose to return to the property listing, continue their search for alternatives or request that the enquiry is forwarded to other properties matching their original requirements. How should I respond? Unlike SHORTLIST enquiries, when responding to an ADDITIONAL enquiry, you need to bear in mind your potential guest has not necessarily seen the listing details of your own Florida villa, condo or townhome – but you have been asked to quote because your home matches the criteria of the first contact to the site, (eg same number of bedrooms and either Orlando or Gulf Coast location.) A little extra effort may be needed to help sell your property and you may want to contact them for more information on their requirements to help you do this. (If they’ve supplied a telephone number a quick call may prove useful.) Do make it clear in your reply which home your quote refers too. Remember – if you use the branded response built into the system, your property ID, an image and a link back to the relevant listing page is already there for you! Additional enquiries do perhaps need a bit more time and effort to secure bookings, so they won’t suit everyone, but they DO offer an option to work with extra leads for those that want them. Contact info@directvillasuk.com if you’d like to update your contact preferences to receive these redirected enquiries. Is there any ‘behind the scenes’ selling? In short – No,none whatsoever. Whilst we do promote a selection of properties across our social media platforms in additional to the main site, we do not contact your customers directly to suggest alternative properties following an enquiry. Some of our competitors choose to follow up any enquiries with a barrage of emails advertising several other properties selected by the site – in some cases even alternative countries! This is often an immediate follow up, before the original property owner has had time to reply, thereby diluting the quality of the original leads without the knowledge of the original recipient. Direct Villas Florida give owners registered with the site the choice to deal with the level of enquiries they wish to receive, whilst also generating additional business with a system that is fair and transparent in its approach. There is no ‘behind the scenes’ selling hidden from owners. Your enquiry notification will be marked as DIRECT, SHORTLIST or ADDITIONAL giving you a clear idea of how many others could be competing for the business and the time frame required for replying in order to give you the best chance of securing the booking. If you’d like to find out more about selecting your enquiry preferences or would like to opt into receiving ‘additional enquiries’, then please contact Direct Villas UK. This entry was posted on Sunday, March 1st, 2015 at 4:05 pm	and is filed under Blogroll, General Advice, Marketing your Florida villa, Uncategorized. You can follow any responses to this entry through the RSS 2.0 feed. You can leave a response, or trackback from your own site.